, almost 88.2 million people--or half of all U.S. adults who use the Internet--redeemed an online coupon in 2011, and this number should increase to 96.8 million by 2013. So it’s no wonder why so many companies, big and small, are using discounts, in the form of daily deals, to drive increases in sales. 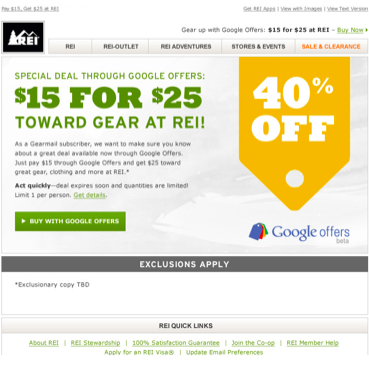 In November 2011 Google Offers partnered with REI, the nationally loved outdoor retailer, to run REI’s first-ever daily deal and Google’s first-ever national offer: $15 for $25 worth of outdoor gear from REI. A 10 day teaser campaign on Google’s GDN, which drove people to a co-branded landing page for the offer. 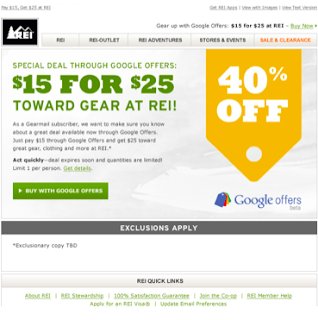 An email campaign sent to REI’s opted-in subscriber base and to Google Offers opted-in subscribers on the day of the offer. REI Facebook and Twitter posts were published the day before the offer and the day of the offer. Facebook promotion on the REI brand page, including real-time interaction with customers to answer any questions about the offer. 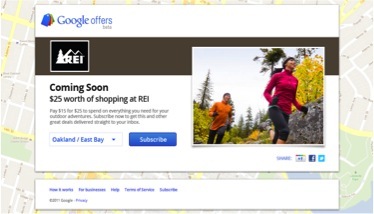 Beginning on November 3rd, the REI Google Offer ran for 24 hours and was purchased by nearly 90,000 people across the U.S. The one-day deal has driven a significant amount of sales, both online and offline, and the average order value exceeded REI’s already high expectations. Further analysis will continue through the end of the redemption period to understand the total business impact, but it’s clear that REI will continue to see a benefit from their Google Offer. “Our objective in running a Google Offer was to understand if we could attract new REI customers and increase traffic to our stores and to our website. Additionally, we wanted to gain a better understanding around how daily deals work for REI and if it would yield similar or higher average order values across both new and loyal customers. We have seen strong redemption and are continuing to track the results through the end of the redemption period. Overall, we are happy with the results of our very first daily deal with Google Offers,” said Harting. If you’re a merchant and are interested in running a Google Offer, please visit: google.com/offers/business. People love saving money. According to eMarketer, almost 88.2 million people--or half of all U.S. adults who use the Internet--redeemed an online coupon in 2011, and this number should increase to 96.8 million by 2013. So it’s no wonder why so many companies, big and small, are using discounts, in the form of daily deals, to drive increases in sales.